Cleaning your dirty bathroom can be the most dreaded job. It's usually the room with the most germs so it needs to be cleaned regularly. Always work from top to bottom. Starting with the mirror, spray it with glass or vinegar cleaner. Wipe it until there's no streaks. Put away all the clutter around the sink. Spray the whole area with all purpose cleaner. Wash and rinse well. Dry the area. Also wipe off anything that belongs on the sink counter like the toothbrush holder. 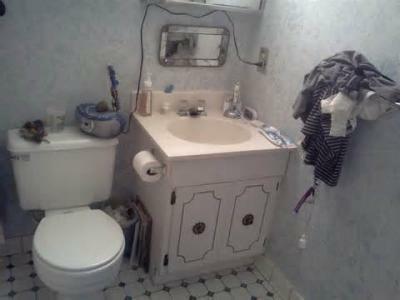 Remove clutter off the top of the toilet. Spray top to bottom of toilet with all purpose cleaner. Saturate the inside of the bowl with toilet bowl cleaner including under the rim. Wash an rinse toilet from top to bottom. Scrub inside toilet bowl cleaner wit a toilet bowl scrubber and flush. Next remove every thing from tub and shower. Depending on how dirty these areas are, you would either spray with all purpose cleaner or scouring powder should be applied witha sponge. Rinse and dry to removeexcell soap scum. Remove rugs and wash those in the washing machine. Empty trash, vacuum or sweep floor. Use a good floor cleaner and mop. Your bathroom is clean! Call us to do the job for you. Easy Life House Cleaning 602-404-8675.